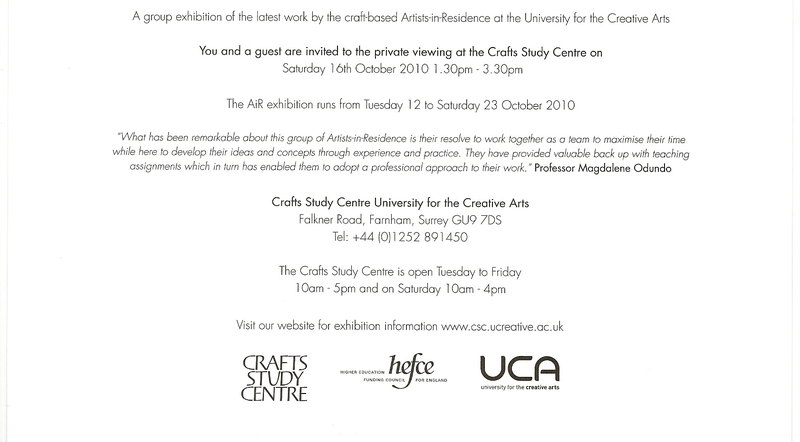 The craft-based Artists in Residence at the University for the Creative Arts, Farnham, celebrate the culmination of their year through this new exhibition. 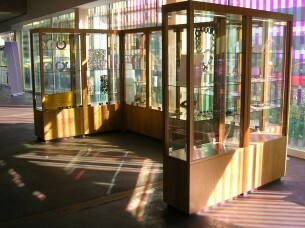 A wide variety of glass, jewellery, ceramics and textiles is shown from a cohort of emerging and award-winning makers. This group of resident artists have spent the last year working with students at the University, sharing their knowledge and working alongside academics to nurture the emerging talents on various courses, while continuing to develop their own professional and creative practice. Participating artists have been recognized in prestigious events, winning awards at Ascot Hat Competition 2010, Goldsmiths Craft & Design Award, the British Glass Biennale and Bullseye Glass ‘E-Merge’ as well as a finalist at the RDS National Crafts Competition in Ireland. 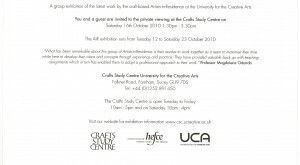 Along with these successes have been exhibitions in the USA and Europe as well as across the UK. This AIR exhibition speaks about the way in which these artists work, make and think by allowing the audience a sneak preview into their practice. With a streamed projection of documentary photography taken by the artists of their making process, they are able to answer the question of how these works make the journey from idea to creation. Work by Kirsty Alman, Banu Bal, Jackie Denham, Shelley Doolan, Hannah Facey, Nao Fukumoto, Rosie James, Tara J. Murphy, Tracy Nicholls and Emma Yeo is presented.